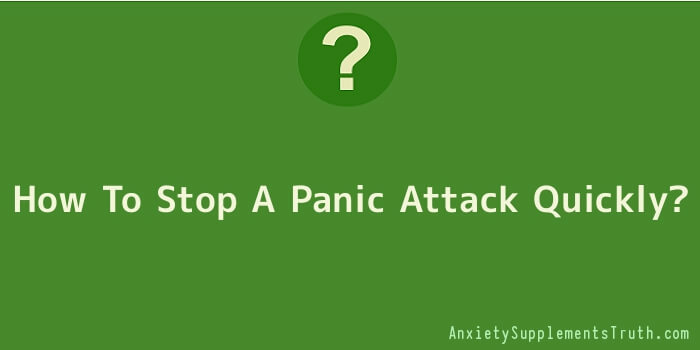 How To Stop A Panic Attack Quickly? Panic can arise in many ways and for many reasons, but panic is much more than dealing with a little bit of concern or worrisome issues from time to time. Panic takes this to a whole other level that is not good for your mental status, physical health, or energy fields. Disruption to its core base is on your mind and controls these modes of thought, issues, and bring this back to the present. Panic resides when your mind starts thinking about the future and not the present and starts playing the “what if” game on you. It can mentally see the pictures in your head and has already played all of the scenarios out for you to the point where your physical body starts to feel the emotional effects on it. When it hits this level, you are not in control, but you can get back in control and very quickly. You have to first start with calming down your mind before anything else. You have to tell that voice in your head, some call a radio voice or the ego mind, that you are in control and that it is not the boss of you. You have final say over your mind, body, emotions, and energy, and have to take control back right now! Tell it, “You’re not the boss of me!” and notice how your stress level starts to drop. Say this over a few times till you start to feel a bit more in control. Next, start with taking some deep breaths and calming your physical body down. Your energy levels and physical body have become very worked up during this panic episode and need to calm down before you can continue on with anything else. To do this, start with your breathing. You will begin to notice you are feeling better and better each and every moment. Other wonderful tools you can use are grounding and centring techniques. To practice grounding, plant your feet firmly on the ground and start to feel the energy connection between you and Mother Earth. Feel as if your feet are growing roots and growing right into the ground as a tree being planted. Focus your attention next on your abdomen area and bring all of this energy to the centre with each breath you inhale and feel it expand out past your physical body with each breath that you exhale. Do this repeatedly until you feel that your physical body has calmed down more and more after each attack. When you are in a panic mode you also have to shift that attention, which can be done be simply focusing on the positive aspects in your life and being grateful for everything that you do have. We never know when panic attacks are going to strike, so try and remember to do a few of the simple steps outlined above and you can then remember more and more of them each time one occurs until you can full conquer your panic episodes in your life.